From an Internet search, it can be seen that this model has been built by many modellers over the years. Most of them don't look as good as the artwork on the box cover. Even our local maritime museum has this model on display. It reminds me of some of the other models the museum has. Because a model was donated, and accepted by the museum, the museum is obliged to keep it, even if a better one comes along. This is my first plastic kit model. All the parts are already made. All I have to do is assemble it. 1) To have a break from scratch-building while still keeping my hands in modelling making. Hoping to give my brain a rest. 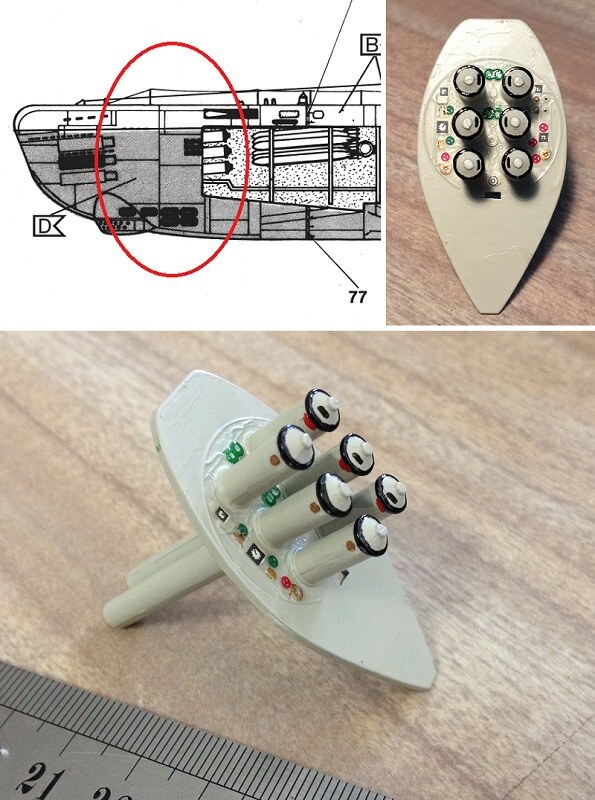 2) I have always wanted to build a model submarine showing its interior. Well the first reason has not proven itself yet. I got myself into some brain-pain from the start. The kit is second hand. Some parts were already played with but not assembled. Soon discovered a few tiny/minor parts are missing. Also, the local maritime museum did not have all the paint colours (they got a stash of second hand Humbrol colours). Had to convert Revell into Humbrol equivalents. Three colours were missing, so I mixed some colours to suit. Some of the greys are so close to each other I wonder why they bother. One grey is exactly the same colour as the plastic kit. Knowing you Peter, you will have some ACES up your sleeve. I can't wait to see this model coming to life. I was looking at this model to do someday, but where to put it in our house, that's the problem. 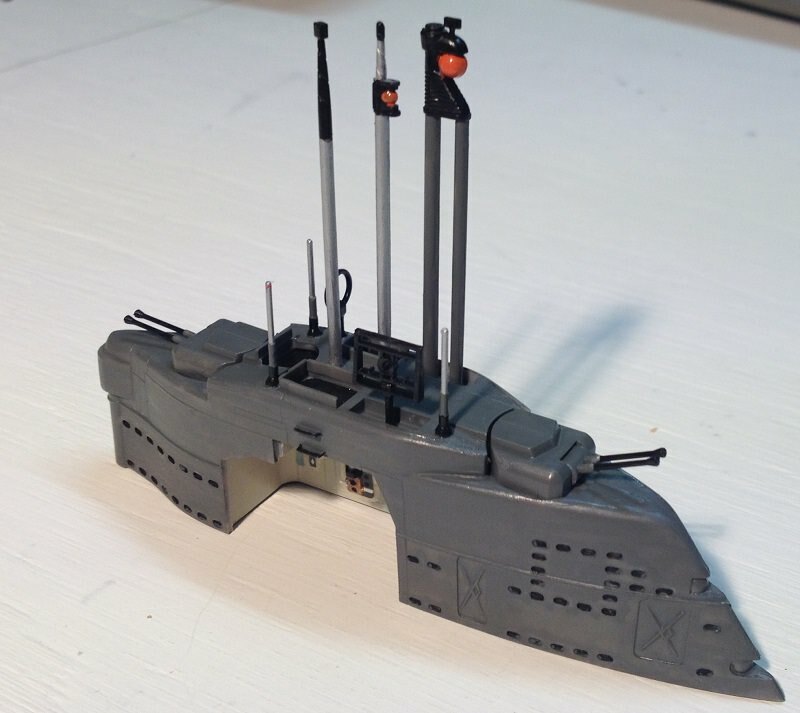 @Peglegreg , that is a huge submarine model. Even the instruction booklet is a 100 times more impressive. 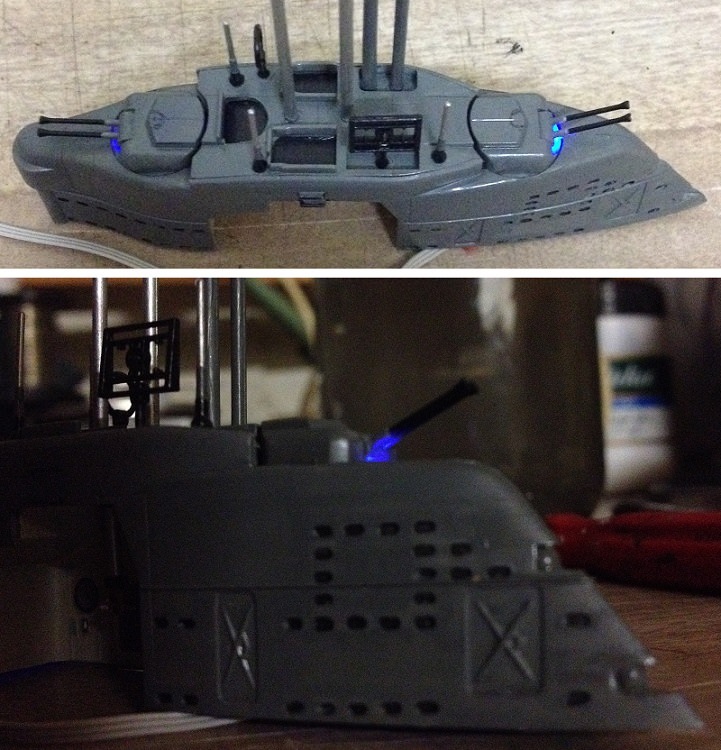 The 1/144 scale sub is just over 0.5 meters - just the right size for me (at this stage). Got stuck into the model today. Some of the instruction steps seemed to be out of step. . . or it's me who is jumping the gun. Could not help myself to have a crack at the conning tower first. This is how it looks at the moment. It is very small for not-so-steady hand painting. Thank heavens they have decals. Other parts get a dab of paint. Still have some touch-up painting to do yet. Here is a problem, the side walls are blank. Will try to remedy this. Looking good mate. Are you going to add some rust effects on the model. I found this clip on the net a few weeks ago....just planning ahead. Thanks @Peglegreg for info about rust and weathering effects on iron. Looks good, if I were to make a scene of a boat after a few months at sea and battle. I am one who likes the unweathered look, as if a model is brand new, just off the slipway. I love colour, bright colours here and there, which weathering is not about. Weathering leaves me feeling dark, dull, and cold. . . (yuck). Even the above conning tower has some bright colours here and there. I cannot help it, it's my trademark. You do as you want mate, if I ever do one, I'll be doing only a bit of rust here and there with some darker fresh paint at random areas to represent maintenance. Hope to get the chance to see how you do it. 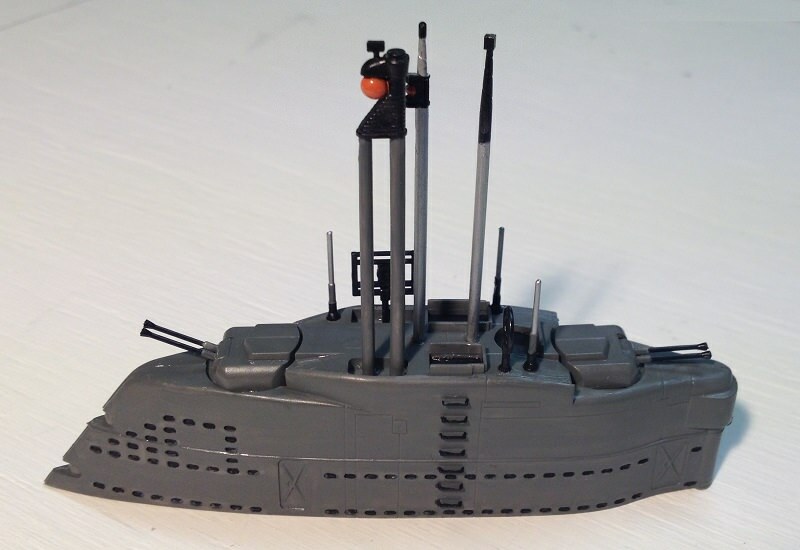 Are you planning to get a 1/48 scale u-boat? You might have to build a bigger shed. Have been researching images of the XXI boat for a few days now. The more I see the more I realize how lacking the Revell model is. I suppose there are appearance reasons which causes the designers to forgo reality. 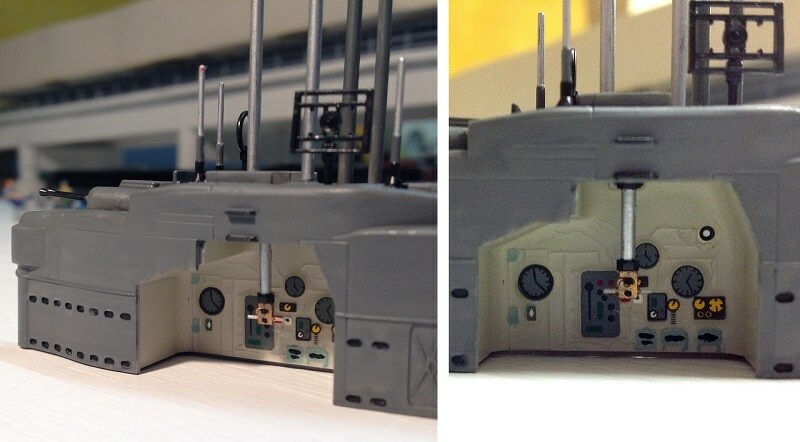 For instance, if the model did include the inner hull there would be a smaller interior view to show. The XXI must have underwent many versions, for nearly every plan shows a different interior. Also, it can get quite confusing seeing different photos of the control room and see very different electro-mechanical items. One area of interest to me has no available images or drawings _ as far as I know. That is, the turret anti-aircraft guns. I only got a few photos showing the possible entry point from atop of the guns. Anything else is a bit of a mystery. You may ask why I want to know. Knowing as much as possible helps to create a better image. Often surprise information may reveal something that nobody has realized, or seen before. This is an old habit I learnt from a commercial art course I did as a young lad. We used to write out a list of keywords associated with what is to be illustrated. From this, certain insights come to the fore. Often resulting in a unique point of view which stand out above the usual. Several ideas have come to mind in terms of how I am going to present this model. I was hoping to include a diorama encompassing the boat, but its cutaway interior view does not really lend itself to the outside world. 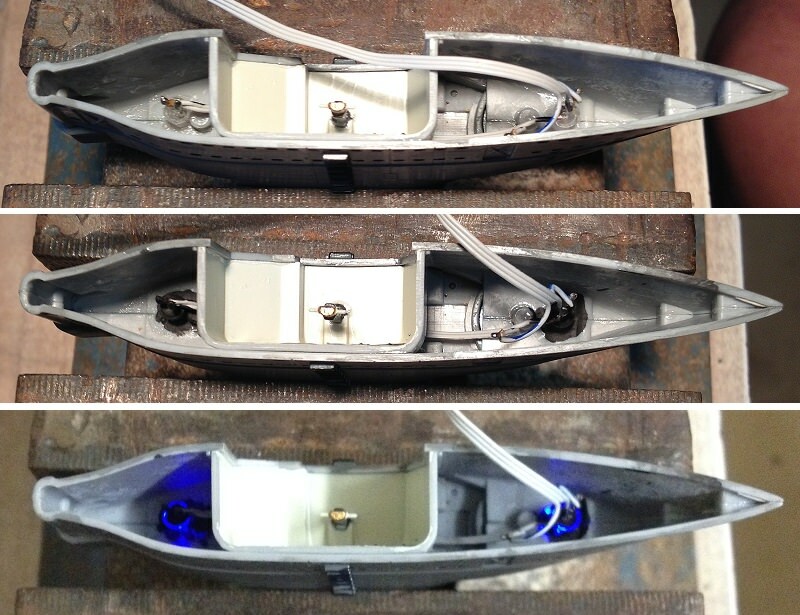 It is more than likely to simply become a cutaway model with the possibility of some diorama happening within the boat. 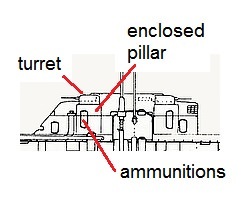 I don't know if this will help you but I found this information on the turret guns on the net. Thank you @Peglegreg for sharing that info. In regards to the turret. The best plan view I got is shown below. Have also seen coloured renderings of the same area. It seems that the there is a round column/pillar where the gunner sits in. Above him, is the top of the turret, which two long hatch doors open. I think this allows the gunner to then use his gun-sights for targeting. There is no window or slot. So it seems the hatch has to be open to see what one is to shoot. Anyway, there is not much I can do about the hatches without botching up the turret too much. I decided to leave the hatch alone. However, I did decide to add a light to indicate that the pillar is lit for the gunner to see what he is doing in their. There most probably is no light, but I thought it would add a bit of drama to the model. I read somewhere that earlier u-boats used a blue-green light for night vision (before the red light was introduced). Any LED light within the sail seems to show through any cracks etc. So I had to isolate the LED, where I wanted to be lit, by direct contact with the plastic shell. I did this by filing the LED domed lens, flat. Gluing the flat portion to the plastic. Then I painted the LED black, to minimize the diffusion of the light. The light shown in the pictures is a bit bright. 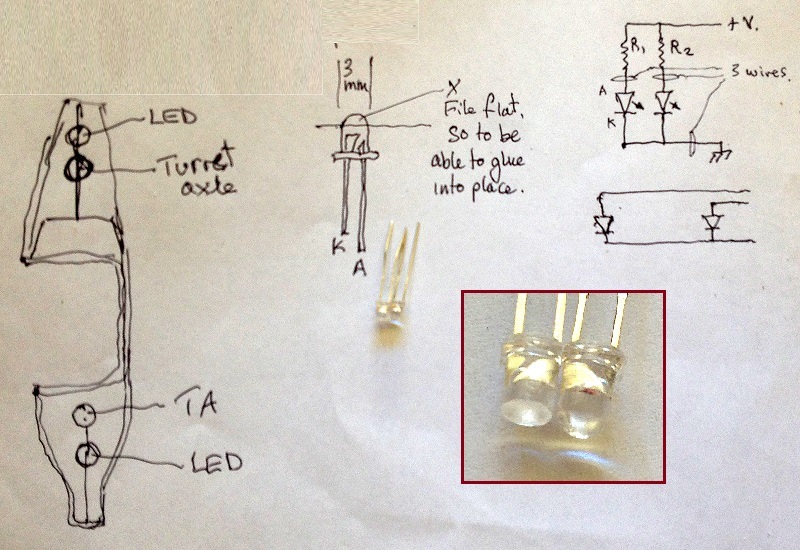 This will be dimmed down by introducing a resistor for each LED, at the power source. With my experience with LEDs in models, the show through is a pain in the, hmmm bum. To fix this problem I simply glued alfoil on the inside were the light has to be. It easy and it works fine. If the wires are properly coated, there are no problems with shorting out etc. For any one who don't know how to speak Ozzie, alfoil is short for aluminium foil! Thank you @Pathfinder65 , @zoly99sask , @Uwek , and @Peglegreg for your reactions. Much appreciated. Starting from the bow is the torpedo tubes. 1/144 scale is fiddly business indeed. as I know there are very often additional photo-etched detailing sets / upgrade sets avialable for plastic kits, like from Griffon or Eduard etc. Do you plan also to use some of these, or do you plan to build her "out of the box" - off course, like we know from you, with your own scratch add-ons? Looking good mate. What size brush are you using. This is the reason why I like to use large scale models rather than the smaller size. It's a lot easier to do larger details. Are you going to LEDs behind the colour ligjt on the instrument panel? Mostly out of the box. Plus whatever I can add to it from scratch add-ons without going overboard. Painting extra bits not suggested by the instructions can go a long way to improving the model. That is why the torpedo tubes have been painted with more than one colour. I do see whatever photographs from the Internet to guide me. Have not heard about Griffon, etc., until now. They make some nice tiny detail stuff. But I'll just stick with what I've got for the time being. 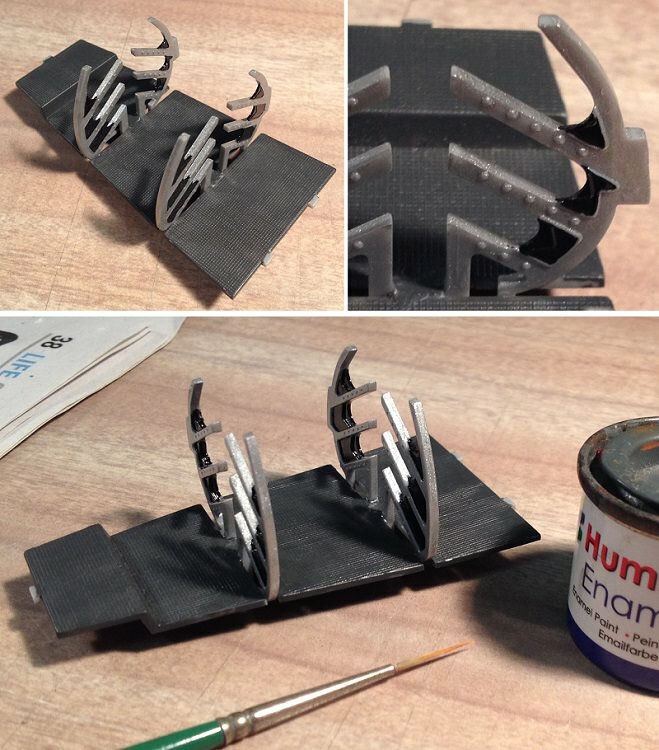 Besides, its more fun creating your own than to buy and add to the model. Thanks for referring me to Griffon, etc. I use different brushes. The usual fine brushes for general painting of the model. For the finer stuff I use a fine lining brush (5/0) size. I have two, the older on is my favourite since it has lost a third of its hair, which makes it even finer. Today, while painting the torpedo tubes, I was wishing I had an even finer brush. May eventually cut some hairs off to suit. There is an ideal consistence needed with the paint. And I often have to unload the brush to the right volume of paint before applying it. I am a bit rusty with such applications. Have not done fine work since I was a young man. ...Are you going to LEDs behind the colour ligjt on the instrument panel? Ha ha ha, not quite. There is no room/gap. The inside wall is also the outside wall. But I would not let that stop me from trying. Lighting instrument panels is asking too much (without a gap). However, I have a few ideas which I will be experimenting with. I will share those experiments (including my failures) some time soon. I am first waiting on a few parts. However, I have a few ideas which I will be experimenting with. I will share those experiments (including my failures) some time soon. I am first waiting on a few parts. In post #14, the drawing also shows the torpedoes rack, just before the tubes. @Peglegreg , I included that fine brush I use. Pity my unsteady hand does not give it justice.